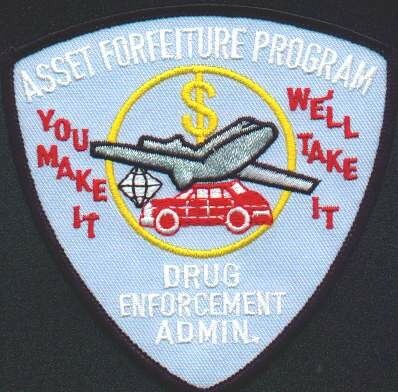 The motto and emblem of the DEA's asset forfeiture program. In their complaint filed earlier this month, federal prosecutors estimate that the 350-acre music venue and campground Camp Zoe is worth $600,000. The authorities say the land should be confiscated using a procedure called civil asset forfeiture because it was "knowingly rented, leased, profited from and made available for the use of...manufacturing, storing, distributing or using controlled substances." If a judge agrees and rules against Camp Zoe owner Jimmy Tebeau, the government will take control of the land and likely sell it to the highest bidder at an auction. Under state law, the proceeds from such a sale would go to Missouri public schools. But, because the Camp Zoe case was initiated in federal court, the money would almost certainly be divided between the DEA and the Missouri State Highway Patrol, the two agencies who conducted the investigation that led to the asset forfeiture complaint. And that's not at all unusual. According to a variety of sources -- including attorneys, activists and reports from the Missouri State Auditor -- Missouri law enforcement agencies routinely use the federal asset forfeiture process to sidestep state law. That allows them to take property without necessarily filing criminal charges first, which is not allowed under state law. It also allows them to hundreds of thousands of dollars that could be used to fund public education for their own budgets. Eapen Thampy, a policy analyst for the Kansas City-based non-profit group Americans For Forfeiture Reform, obtained records of each Missouri county's deposits into the state's "School Building Revolving Fund" via a Sunshine request. Thampy then compared the records to state audits of the forfeiture activity. After crunching the numbers, he concludes that "90 percent of counties in Missouri are non-compliant" with the state law that requires forfeiture proceeds be used to fund public education. "We're talking $60 to $80 million that has been misappropriated," he says. "'State law enforcement has been able to dodge all requirements of the system and keep that money directly for their budgets." Asset forfeiture originated in 1970 with the passage of the Racketeer Influenced and Corrupt Organizations (RICO) act. It is now widely used to punish drug dealers, allowing authorities to seize money, houses, cars and other assets that were used to commit crimes or purchased with the proceeds from illegal activity. "It's another tool in the toolbox," says Richard Callahan, the U.S. Attorney for Eastern Missouri. "Forfeiting is a key part of the attempt to achieve justice." 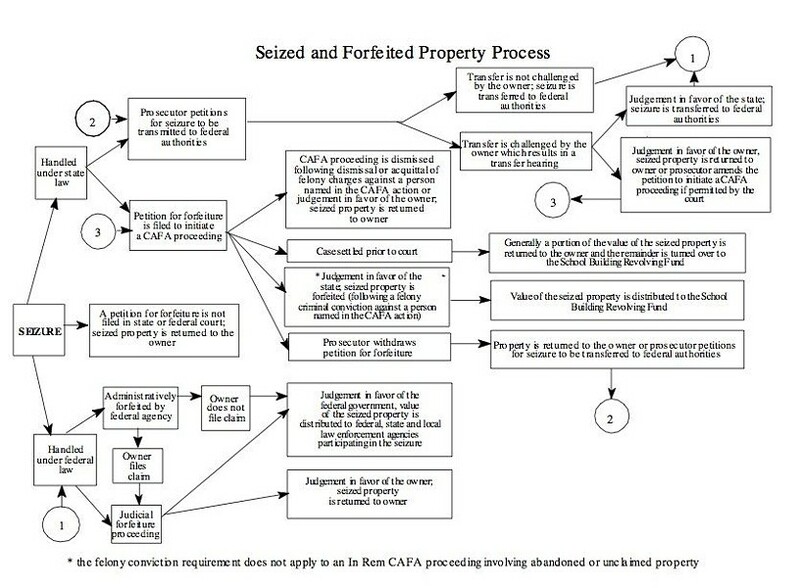 Forfeiture processes can play out in both state and federal court. In 1994, after newspaper reports uncovered widespread abuses, the Missouri legislature approved several reforms for the state system. These included the creation of the school fund and a stipulation that any transfer of a forfeiture case from a local to federal court must be approved by both a prosecutor and a circuit court judge. That last part is key. Missouri's reforms only apply to forfeitures in the state system. But local law enforcement agencies know that they may still keep seizure profits for themselves if they use the federal system. In federal cases, an agency such as the DEA takes a percentage of the money seized -- usually 20 percent -- and returns the remaining 80 percent to the local police, an exchange called "equitable sharing." None of the money goes to the schools. Steven Kessler, a New York attorney who has penned two books on forfeiture law, says the "equitable sharing" system is routinely exploited by law enforcement agencies as a way to pad their coffers. (Several states have laws similar to Missouri that require local forfeiture money to be used for education.) He says judges simply rubber stamp transfer requests from local police, rendering state-implemented safeguards ineffective. "This has become a fundraising tool," Kessler says. "The state law enforcement, seeing the adopted forfeiture program that the feds have, said, 'It's too difficult to get funds under our state forfeiture laws, why don't we get the case, turn it over to the feds and we get 80 percent of funds and we don't do anything.'" Callahan, the U.S. Attorney, says he helped write Missouri's asset forfeiture reform law in 1993 while he was a prosecutor in Cole County. He explains that his office has guidelines regarding which asset forfeiture transfers they will accept from local law enforcement. "The only time we're going to engage in forfeiture is if there was, or is going to be, a federal investigation or prosecution or federal officers were source of information that led to the seizure," Callahan says. "I understand the federal system does provide incentive for money and the state law does not, but I'm naïve enough to believe that we in law enforcement are there because we're trying to do good, not because were trying to pad our budgets." However, analysis of the state auditor's reports on asset forfeiture activity reveal that hundreds of thousands of dollars changed hands between local and federal agencies, while just a small percentage went to the state's public schools. The following chart shows that federal agencies taking their cut have consistently earned more money from forfeitures than the school fund. Last year, 49 percent of the total went to the feds -- while just one percent was given to the schools.